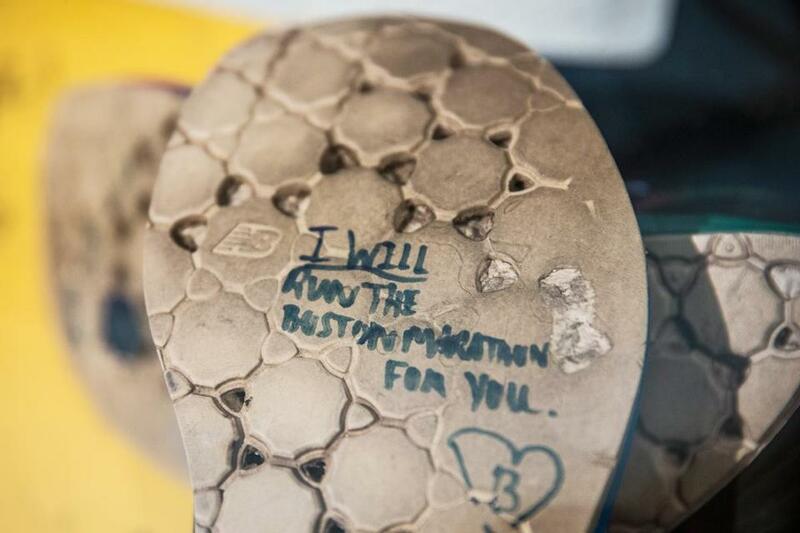 A runner’s shoe, left at the finish line last year, reads “I will run the Boston Marathon for you.” The shoe is part of a memorial display at the Boston Public Library. In the year since two bombs exploded in the midst of the Boston Marathon, killing three spectators and altering the lives of dozens of others, Boston has learned much about itself. Like an individual confronting the death of a loved one or some other calamity, the city was set forth on an uncharted landscape of grief and renewal. The pain was not divided equally; the families of Martin Richard, Lu Lingzi, and Krystle Campbell were left with a void that can never be filled. For many of the injured, the struggle continues, and the pain of adjustment will linger even after the physical misery has abated. And there were the many medical and public-safety officers — one of whom, MIT police officer Sean Collier, lost his life — to whom all Bostonians owe a debt of gratitude. The bombings, however, were more than just a series of life-changing moments for individuals. They also represented a challenge to Boston’s civic fortitude. So often in such circumstances, fear and anger can warp a city’s judgment — or a nation’s — and turn people against one another. These aftershocks are part of the evil of terrorism, widening its circle of destruction. It isn’t just the explosion but the aftermath that brings about confusion and disarray. Boston, it can proudly be said, has not turned against itself. For that, it can thank factors as varied as the quick resolution of the case, the unifying effect of a manhunt in which everyone shared to some degree, and the spirit of the Marathon itself, a universal event that was both locally honored and internationally embraced. But it was more than those chance factors: An inner character came to the fore. Many have portrayed this as a spirit of resiliency, a toughness that emerged in the face of adversity. But that ignores the subtler ways in which wisdom and perspective are crucial allies in any emergency. In that respect, what the city didn’t do after the Marathon bombings is as noteworthy as what it did. Boston didn’t hunger for retribution in a way that might have disrupted its unity. In fact, polls suggest that most Bostonians don’t wish to see the surviving bombing suspect, Dzhokhar Tsarnaev, put to death. Boston knows that a furious demand for “eye for an eye” justice is just what terrorists want to provoke, to make real the clashes that exist only in their own demented minds. Boston didn’t turn on its Muslim community, even though the suspects turned out to be Muslim immigrants. The Islamic Society of Boston Cultural Center reported an outpouring of support, far outweighing the handful of intolerant acts. Not a single local politician or religious figure sought to stoke up anti-Muslim sentiment, a sign of the mature judgment and stability that characterizes the local political and religious scene. Boston didn’t sacrifice its own commitment to, or its enjoyment of, major public events in the name of heightened security. Yes, greater precautions must be taken, and spectators at all events should expect some inconveniences. But the events themselves, from the Red Sox victory parade to First Night to concerts on the Esplanade, have continued, and thrived. Next Monday’s Marathon is only the latest expression of undiminished civic pride. “Boston strong” isn’t a feeling that grew out of the bombings, but rather a description of what was there all along. Character is strength. Wisdom is strength. Maturity is strength. Civic commitment is strength. And on these scores, Boston has shown itself to be strong, no matter what challenges lie before it.